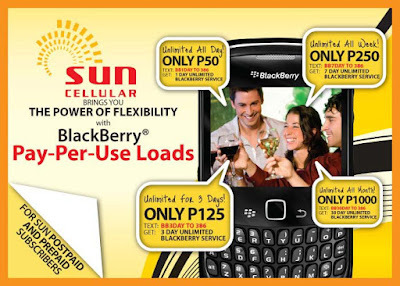 Just like most of the people in my crowd, I have Sun Cellular as my alternative mobile phone service. Their cheap unlimited rates got me sold. I abuse their service for my text brigades, booty calls and for almost all my insignificant triflings. Note that my reliance on Sun Cellular's service is with in the bounds of recreational use. Although I give them credit for keeping the bigger telco's from whimsically pricing their services near swindling levels, I wont entrust my life nor assets to them just yet. Now that they have entered the market as the newest Blackberry Internet Service (BIS) provider with their Pay Per Use Loads version, I had high hopes that maybe I could rely on them for my internet mobility needs. Boy, was I wrong! This is going to be a disappointed and a near rant post about the one day service I registered for. First. The rates are not competitive at all. Smart and Globe have had BIS going for over a year now and are offering Blackberry related promotions at significantly lower rates. Ive tested both networks and I was satisfied with them, Globe with their BB Social promo, being my preferred network. Sun could have at least launched their service at a fraction of the current prices, considering they are known for affordability. Second. Speed is just unbearable. They are Pong Pagong slow in loading apps and Im not even the type who multi-task on my phone. Their poor signal strains my battery, resulting to my phone becoming useless in just six hours. Bugger! Third. Annoying 7210 sms notifications. What's the deal with sending me at least 8 reminders to load my account in a day? Ever since I registered for one day BIS they've been irritating me with these relentless notices. But I am not writing Sun Cellular off just yet. After all, Sun is now a PLDT subsidiary, hopefully they get to share in of some Smart's power lines. I have a feeling they can redeem themselves in no time. i used to have high hopes that Sun is a david challenging the goliaths Smart and Globe, these behemoth brands who seemed to have put immense laxity to their services, until one of the goliaths, PLDT, whom we all know to be directly affiliated with Smart, bought Sun. and now that hope is 6feet degrees under. i remember one marketing genius said that nature will follow the law of duality. the Globe and Smart(with Sun under its umbrella) might be a case of natural process. I have been a sun blackberry postpaid subscriber for almost a year now and so far I have not encountered the same problems. Internet speed is great, even faster than Globe and Smart (yes, I tested both) and their unlimited package is truly unlimited in the sense that if your BB apps use wap instead of bis, you won't have those "hidden" charges for data use thru gprs. Tried using Smart and Globe BIS but I always end up going back to sun because of the speed and reliability. just an update.. ive been experiencing ( i wouldnt call it enjoying ) free unlimited bis from sun! i dont know why, and when i asked their customer service, they had no answer. however with much dismay this doesnt change the fact that their bb service is still so annoyingly slow and unreliable.. my review of sun's bb service is still a thumbs down!